Ahhhhhh! Isn't the title of the film blinking lovely, folks? In fact, I think it's so blinking lovely, I better watch this 70 minute movie made in 1948, or else I may cry like a blinking baby. Quickly, someone pass me the hankies. As I might dribble on its blinking Director: William Witney; or one of his blinking Actors: Roy Rogers, Jane Frazee, and Andy Devine. So there I was, Roy Rogers (Roy Rogers), hanging loose with the rest of my gang back at the ranch. Happily awaiting for my ten year anniversary in show-business, that'll occur in two days time. When suddenly, out of the blue, I catch-wind that one of Pop Jordan's (George Lloyd) henchmen is trying to rustle-up my herd of horses over by the range. But don't you worry your pretty little heads off, folks. As soon as I get there I make short work of this unscrupulous feller by smacking him right in the mouth before sending him on his way. Furthermore, just to show Pop Jordon I don't hold any grudges, I hire his own grandson, Ted (Michael Chapin), to be my new aide. Not so long after I hire Caroline Bullfincher (Jane Frazee) to be my new stable-hand too. Still. That's most probably why what next transpires gets a bit melodic when someone close to me kidnaps my horse, Trigger, and then holds him to ransom. As a bad man gets shot - a song defines the plot - a barn becomes very hot - and at the end of the day, I can easily be compared to a singing Randolph Scott. 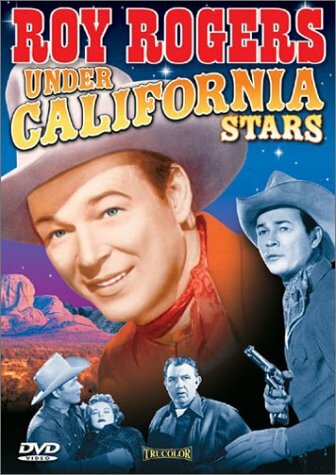 Now to be completely honest with you, folks, I'm finding it rather difficult to figure out if I actually liked watching 'Underneath California Stars' or not. On the one hand I did get some pleasure out if its very simple yet wholesome narrative, plus those rather harmonic tunes 'Roy and the gang' sang were pretty decent to listen to as well. Whilst, on the other hand, the overall wholesome vibe this flick exhumed was a bit too much for my own liking, and I couldn't really connect with any of the characters either. Hey! Please don't get me wrong. I totally understand that this film was made during an era where women were scared of mice, kids did as they where told, nobody f*cking swore, and men sat around on the floor playing cards with each other. And to be absolutely Frank about it, I must admit this sort of thing doesn't bother me that much whilst watching this type of a picture. In fact, I feel this 'peachy keen production' can be kind of refreshing on occasion. Going so far as to define it as 'a breath of fresh air swimming about in a sea of stale and dank oppression'. Having said that though, the fact remains that this movie isn't really my sort of a movie. And that is why I plan on sitting down and watching more of them in the near future, just so I can figure out my own uncertainty, despite being a modern man with an old head on his shoulders. One minute! I know what I can do to put me on some equal footing. I can present you with the following filmic-facts. That might work! (1) 'Republic Pictures' first released this production on the very same day that the United States government ordered an atmospheric nuclear test at the Enwetak Atoll -- the 30th of April, 1948. (2) Loosely translated, this project was entitled 'Bullets Treacherous' in Brazil; 'California Star Flicker' in Finland, and on occasion, it has used the two alternate titles, 'Under Californian Skies' or 'Under Western Stars'. (3) The majority of this movie was shot on location at Santa Clarita and Chatsworth Park, both located in the Californian state of Los Angeles. 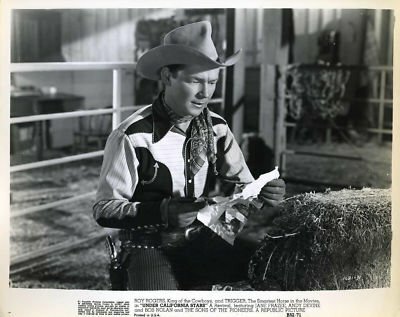 (4) Roy Rogers' real name is actually Leonard Franklin Slye, and he was given the nickname, 'King of the Cowboys', because he featured in over one hundred movies and television shows during the 30's, the 40's, and the 50's. (5) Sloan Nibley, who was one of the writers assigned to script this flick, also wrote numerous episodes for the 1999 edition of 'The Adams Family', as well as the original 1965 edition too. (6) The director of this western, William Witney, was in the business from 1937 to 1982, and during that time he directed such television shows as 'Lassie', 'Zorro', 'The Tall Man', 'Bonanza', 'Kojak', 'The Virginian', plus many-many more. (7) Whilst the original version of this film is 70 minutes long, for some unexplained reason the edited version of it is only 54 minutes long. For your knowledge, I watched the original version. (8) After this slice of cinema came home for supper, Roy Rogers lent his voice to the animated-adventure, 'Melody Time', Jane Frazee starred in the crime-thriller, 'Incident', and Andy Devine starred in the romantic-drama, 'The Gallant Legion'. Now before I trundle off to parts unknown, please allow me to mention three things I really did like about 'Underneath California Stars'. Firstly, as I previously mentioned, I was fond of listening to the music harmonized in this flick, even if it did break-up the story-line with its melodic presence. Secondly, I loved watching all of the scenes featuring the animals, and I especially got a kick out of that race between Trigger and the dog. And thirdly, I've got to add that I am very intrigued by Roy Rogers, because to me he comes across as the quintessential 'Superman' character, by playing it nice, playing it fair, and playing it as if he is what he really is. Wholesome and pure.